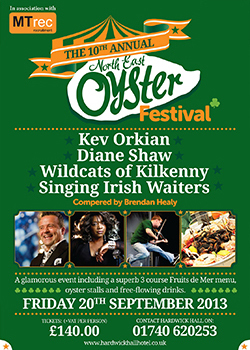 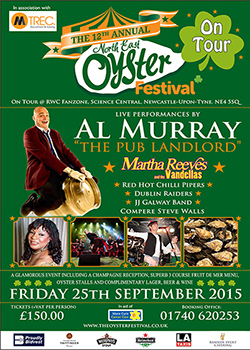 Since 2004 the North East Oyster Festival has been synonymous with lavish food, fine wines and fantastic live entertainment. 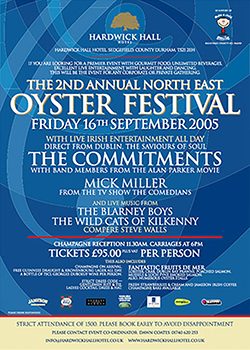 On a sunny Friday on the 15th September 2004 the very 1st Oyster Festival was held. 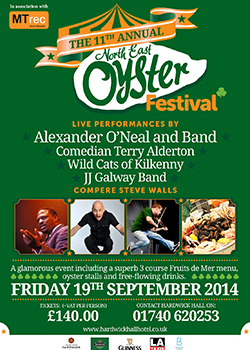 A splendid occasion with Irish entertainment headlined by Frank Carson it was a complete sensation! 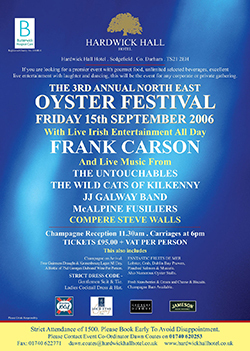 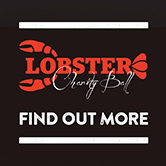 Since that date at Hardwick Hall Hotel we have hosted seven North East Oyster Festivals and six Lobster Festivals, the sister of the Oyster created to satisfy demand for this premier corporate and social event that is now hailed as the very best event in the North East of England's social calendar. 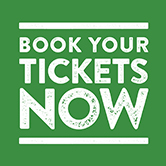 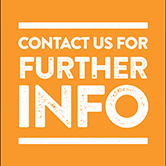 From Bobby Davro to Al Murray, Ed Byrne to Patrick Kielty the quality of entertainment has been brilliant a tradition we aim to continue for many years to come. 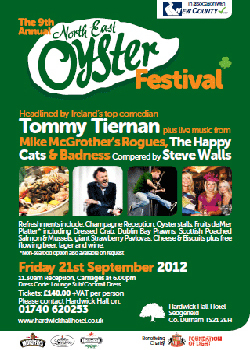 Friday 21st September 2012 - A fabulous day of food & entertainment. 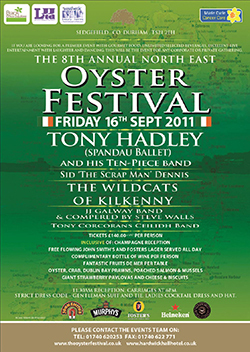 The Oyster Festival 2011 - Great day of fun, food and entertainment! 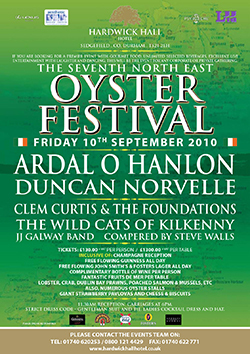 2010 Oyster Festival - this was a rollercoaster of fabulous entertainment, comedy, music & food! 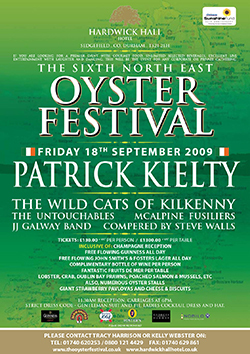 2009 Oyster Festival - Patrick Kielty - topped the bill with top class Irish humour! 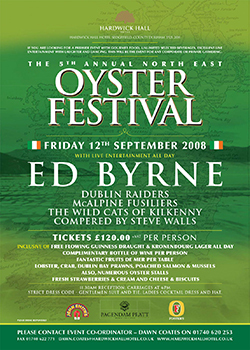 2008 Oyster Festival - Sure now Ed Byrne was just amazing - a great Irish comic supported by the very best of Irish bands. 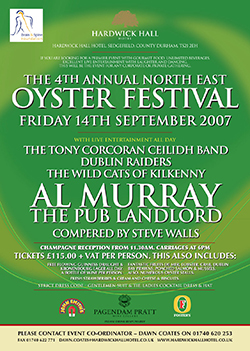 2007 Oyster Festival Attendance: 1950 "So many people - fantastic organisation! 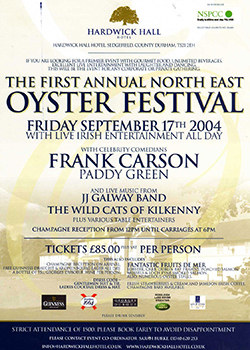 A superb day, good weather"
2006 Oyster Festival Attendance: 1733 "Frank Carson, Guinness ~ spot on! 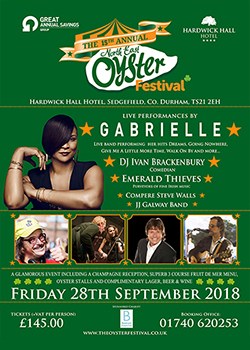 Tried Oysters for the first time - loved them"
2005 Oyster Festival Attendance: 1126 "Entertainment was brill' - The Commitments made the Marquee rock"
2004 Oyster Festival Attendance: 750 "Didn't know what to expect - this is fabulous - a definite yearly event"